As a result, Duke is in the Sweet 16, and if you think that I am going to back off the take that the Blue Devils are the best team in college basketball, you're nuts. I think the UCF game had more to do with matchup than anything else - UCF is uniquely suited to beating this Duke team - and I'm not convinced the rest of the country has the horses to do what the Knights did. 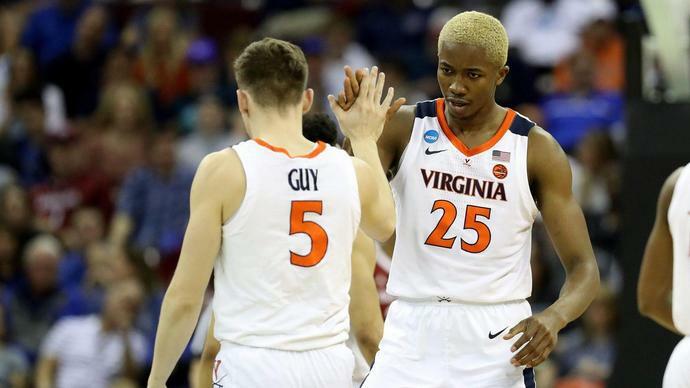 Virginia shook off a slow start against Gardner-Webb and make their way to the Sweet 16 in relatively comfortable fashion. With the way the draw broke down, Virginia actually has the easiest path to the Final Four if, for no other reason, they are the only team that doesn't have to face a top five seed in the Sweet 16. They just draw the Pac-12 tournament champion Oregon Ducks, who have won ten straight games, the last eight of which came in road or neutral court venues. It's crazy to think that we're just a week removed from everyone questioning just how good Gonzaga is after they lost to Saint Mary's in the title game of the WCC tournament. It's also crazier to think that Gonzaga is the No. 1-seed that faced the least game pressure in getting to the Sweet 16. They were the only top seed that did not play like they had their feet stuck in quicksand in their opening round game, and while Baylor made some noise in the second half, there was never any real threat that the Zags would lose. I am, admittedly, higher than I maybe should be on this Texas Tech team, but in my defense, that's because I think the world of Chris Beard as a head coach and Jarrett Culver as a go-to guy. The Red Raiders are one of the nation's elite defenses, and with the way they have been shooting the ball over the course of the last eight weeks, they can hang with just about anyone. Throw in the fact that they were the top seed that was challenged the least in the first weekend, and my love affair with Texas Tech is still in full force. I'm not really sure what to make of the Vols at this point. On the one hand, this is a group that has been a top eight team all season long. They have an all-american in Grant Williams that played like an all-american this weekend as well as a future NBA wing in Admiral Schofield who played like a future NBA wing. That's all good! Every time I watch Michigan play I wonder just how in the world they are going to be able to score enough points to win. Then they start playing defense, Zavier Simpson starts making hook shots and before you know it, they're up 40-28 with 12 minutes left and a comeback seems impossible. Watching the Michigan buzzsaw take on the Texas Tech buzzsaw this week is going to be tremendous theater. I've come full circle on Florida State this season. I thought they were one of the most overrated teams in the country heading into the year, and at this point I think that they are probably the most underseeded team in the field. Part of it is just how disruptive their defense can be, with the number of switchable athletes they have on the roster. Part of it is the emergence of Terance Mann as the heart and soul of this group. And perhaps the biggest part of it is Mfiondu Kabengele, who has developed into one of the best players in this tournament even if Leonard Hamilton refuses to use him in the starting lineup. I don't know if the Cougars have enough to be able to make a run to the Final Four, but I do know that they are as well-coached and as disciplined as anyone left in this event. The way that they move and rotate on the defensive end of the floor is so impressive, and their quarter of guards - Corey Davis Jr., Armoni Brooks, Galen Robinson, Dejon Jarreau - are really dangerous. Getting Kentucky with a banged up P.J. Washington is a nice little break, too. The Spartans are the one team this season that just keep performing at a ridiculously high level despite the fact that they don't necessarily have the roster pieces that justify how good they have been. So while part of me says, "this is why you trust Izzo," another part of me is waiting for the exhaustion to kick in and the lack of depth to kick in. How long can Cassius Winston carry a team on his back? When Justin Robinson was fully healthy in January, Virginia Tech was a top ten basketball team. When he was gone, they went 7-5 and stumbled their way into a No. 4 seed. Now that he's back, is he healthy enough to make the Hokies a top ten caliber team again? I'm not sold on that yet, not when he spent quite a bit of time in the first weekend hobbling around on a foot that looked like it still hurt. Because he has been Kentucky's best player this season. When the Wildcats made the jump from being a team that we thought had a chance to be great into being a team that actually was great, it was when Washington turned into a superhuman. He was the best player in college hoops for a five-week stretch. That's when Kentucky became a real title contender. And he was in a cast - not a walking boot, a cast - this past weekend. Maybe Cal is telling the truth when he says that this was more precautionary than anything else. At the very least, I'm skeptical, and even if that is the truth, are we sure that Washington will be 100 percent if the cast does come off for Friday's game against Houston? We saw just how good can be when Carsen Edwards has a ceiling game on Saturday night. He went for 42 points and the Boilermakers beat Villanova by 26. We also saw that Purdue is beatable when Edwards has what has become an all to typical performance for him: He went 7-for-23 from the floor in the first round and Purdue because Old Dominion by just 13 points, which wasn't enough for a cover in a lot of places. If we're talking about talent, I'm not sure there are four teams with more than LSU has on their roster You can see how good they are when they jump out to massive leads on anyone they come across. LSU's problem is they haven't been able to respond to halftime adjustments that their opponents make, case-in-point being their inability to solve Maryland's junk 1-2-2 zone in the second round. If Tremont Waters doesn't bail them out with a tough, game-winning bucket in the second round, we might be talking about Maryland in this space instead. Here's the crazy thing about Oregon being ranked 16th on this list: I think you can make an argument that the Ducks, who were a preseason top 15 teams, are right about in that same range right now. Louis King has been balling of late. Kenny Wooten has gone full Jordan Bell on us. Payton Pritchard has had his star turn in this tournament. There is plenty of talent on this roster, and the Ducks have found a way to make it all fit together. They've won 10 straight games now, and sure have looked like a team that can threaten Virginia in the next round.